Latest Design Option 1-4, Arched Opening » Roger Perron Inc. 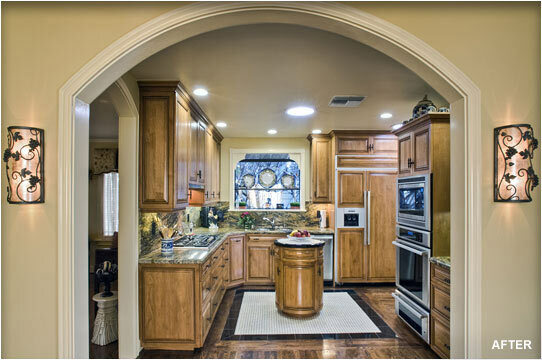 Here, the arched opening from the remodeled dining room looking into the remodeled kitchen. The kitchen island is on wheels for easy relocation. The mosaic tile floor adds charm and is flush with the hardwood flooring. The garden window helps the sink center to have its own special feel for the kitchen. Ample granite counter space. Design for this home remodel and luxury floor plan in Pasadena was created by Roger Perron, design-build general contractor, with contributing architect for working drawings Curt Sturgill.